Ceramicoat Tunnel Coatings are specifically designed for use in vehicular tunnels. The proven formulations have been applied to road tunnels throughout the world. Ceramicoat Type ‘C’ Tunnel Coating will withstand the severe sulphur laden atmospheres encountered in road tunnels, whilst enabling ease of cleaning, increased light reflectance, and protection of the concrete from exhaust deposits, de-icing salts etc. Industrial and Marine Coatings Ltd can operate on an international scale supplying and applying coating and lining systems as required to suit individual requirements and specifications. Ceramicoat has been applied to over 5.5 million square metres worldwide, with examples in excess of 35 years still in good working use. tunnel surfaces like a build up of rubber tyre dust and other foreign matter. These can be causes of flash fires in extreme cases. Industrial & Marine Coatings Ltd can offer cleaning and maintenance services to Clients using state of the art equipment developed for washing walls and ceilings in tunnel environments. 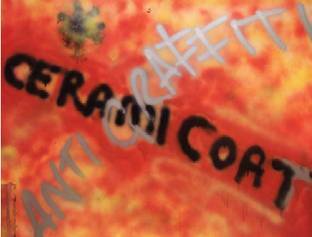 Ceramicoat Type “C” Coating and Ceramicoat “B” Graffiti Remover provide excellent Graffiti management. 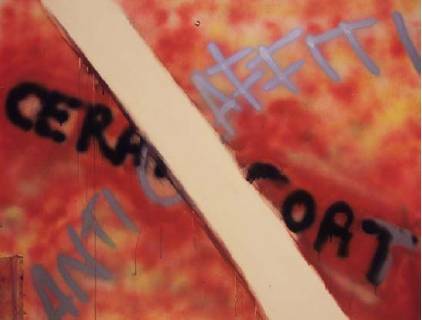 The Ceramicoat Type “C” Coating seals the surface of the concrete (or other substrate) preventing penetration of the Graffiti. Graffiti can then be removed using Ceramicoat “B” Graffiti Remover. No solvents are needed. Ceramicoat “B” Graffiti Remover smells of citrus and is specially formulated to remove marker pen, felt tip, and most other types of Graffiti such as aerosol paints. Photographs show before and after treatment with Ceramicoat “B” Graffiti Remover.